The Lower Modernisms – 029. Matchbook Delight! Part 7, House of Prime Rib. September 28, 2011 by James Black. 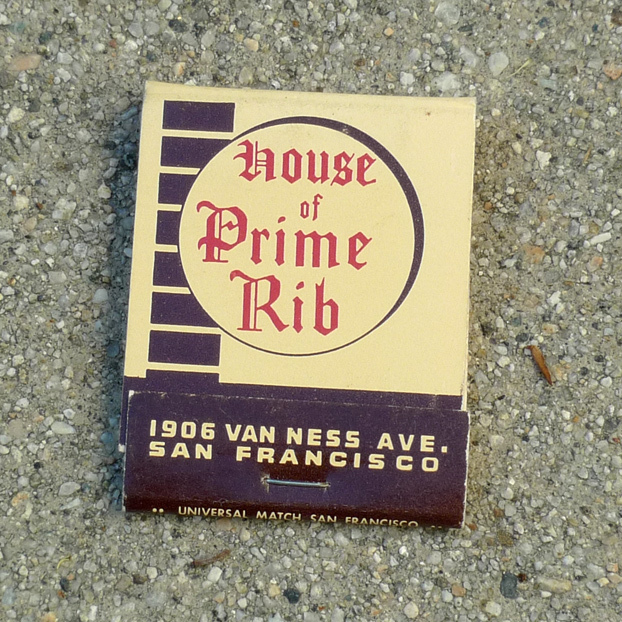 The House of Prime Rib, a hella old school establishment in San Francisco, was established in 1949. This matchbook, probably from somewhere around 1970, has a pleasing character. 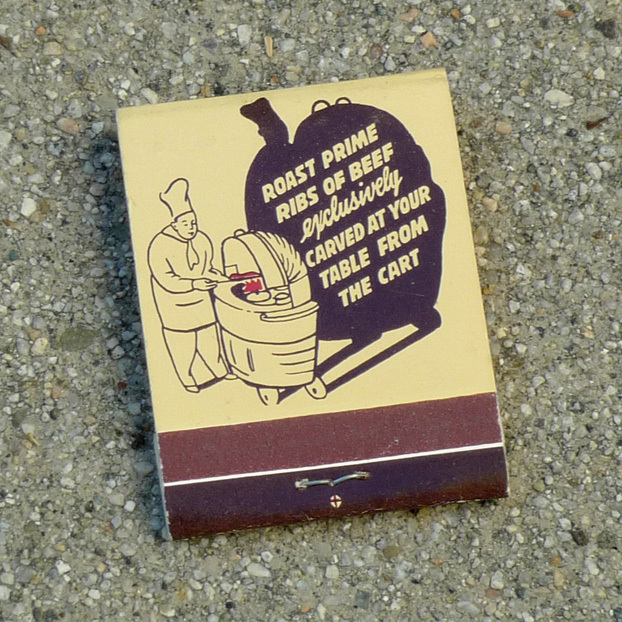 Printed in two colors on a yellow-cream coated card stock, the book features “House of Prime Rib” in Old English lettering in red on a circle configured to look like three-dimensional, casting a shadow. This disc overlaps an asymmetrical black racing stripe along the left side, itself cut by negative lines into a series of rectangles – the composition is an abstraction of a masonry wall with a round signboard attached to it. The cover appropriately hearkens back to Ye Olde England, but in a super-classy way. The street address, 1906 Van Ness, is in a blocky type style. Charmingly hand-rendered, this blocky type does not have the offensive “butch” quality that we revile in another blocky type style, Bank Gothic. 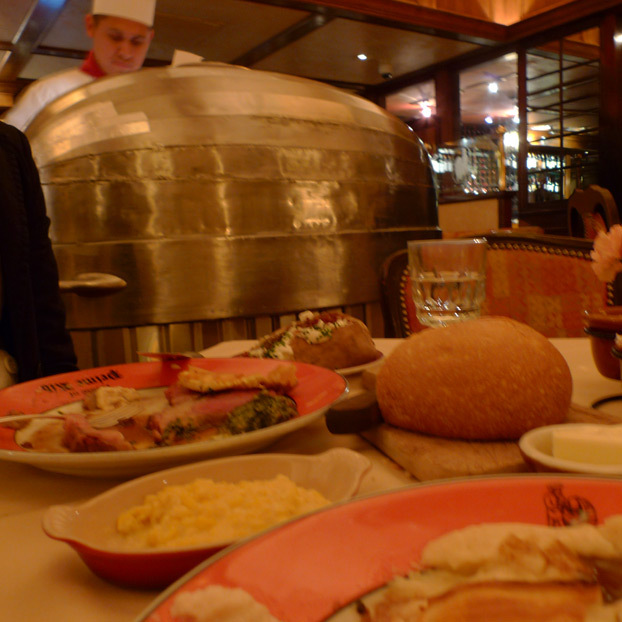 On the reverse side, the color red is again used for highlight, in this case the featured prime rib as carved at your table from a stainless steel carriage wheeled around the restaurant by a chef. The black shadow cast by this chef and his carriage is large-scaled and ominous, like a shadow from a film noir or one of those particularly scary Looney Tunes episodes. 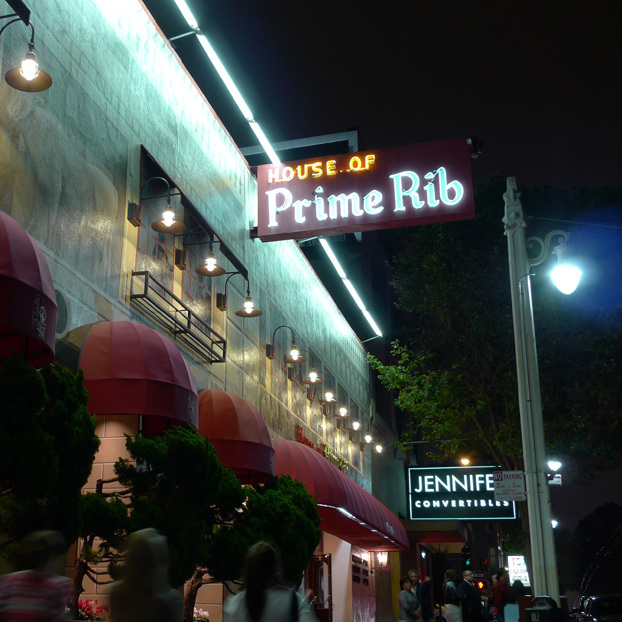 It doesn’t need to be so creepy, but then again, the House of Prime Rib is not for the faint of heart. Somehow the camera captured my dim, blurred vision that evening. HOPR Verdict: delicious, but not for everyday – prime rib so tender, salty, flavorful and gouty, accompanied by this alchemical substance called Yorkshire pudding, this meal is what you would want to eat if you were a toothless, dying, billionaire glutton. Next time I’ll be trying the local prime rib king, Lawry’s.